Stik's iconic street art can say a lot with just a few lines. From his early days, painting life-size stick figures across the East End at night, to his position today as a celebrated, internationally exhibited artist, Stik's disarmingly simple characters have a tendency to pop up in sites of expression against repression and disenfranchisement. A firm believer in the right to protest, and a campaigner for the rights of the dispossessed and homeless, Stik had no formal training in the visual arts. During periods of living on the street, the artist—who now counts celebrities like Brian May and Elton John amongst his legion of fans—posed as a life model at the RA and Central Saint Martin's. It was here that his journey to becoming an artist began—and now his giant, instantly-recognizable murals appear the world over, from the side of a tower block in South Acton to the Jabal Al Qalaa in Jordan. To celebrate the publication of this first, fully-illustrated collection from Cornerstone (the team behind Banksy's Wall and Piece), we're offering you this rare chance to meet the artist himself as he signs copies of his book in the Art department of our flagship Charing Cross Road store. Featuring original work, behind-the-scenes sketches and more, we're sure you'll love this gorgeous book—and where better to get it signed than in the former Central Saint Martin's building? Come and meet one of London's most celebrated street artists—PLUS be in with a chance to win a set of three signed Stik posters, courtesy of Cornerstone, by booking your FREE place in the priority signing queue. Take your place in the queue no later than 6:15pm on the day to be entered into the draw. Stik will pick the winner at 6:30pm. 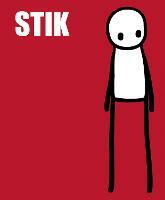 Copies of Stik will be available to purchase at the signing. If you wish to buy a copy before the day you can visit one of our shops or click here to order a copy online. Please note, we do not recommend you place an order for home delivery less than 7 days in advance of the event, in case the book doesn't reach you on time.